We’ve all seen the “helpful” pamphlets in the doctor’s office. They cover a multitude of topics. My oncologist’s office has a variety; none on colon cancer though. Regardless of the topic, there is real life information missing from those little brochures. Things like, how your relationships change with a cancer diagnosis. It’s hard enough dealing with your own feelings. You spouse/partner, family members, children all are now thrown in the mix. It makes it difficult when you look “normal”, but your body makes doing simple things like watching a long movie or cleaning the kitchen a burden. Let me tell you, my poor house is nothing like it used to be. I have to give in and admit, I cannot do it all. I wonder if my family will ever realize that? I’m not knocking them. I know they see me as fine, regardless of the endless pills I swallow for two straight weeks. Another thing missing is what happens if your spouse can’t work; even temporarily? Does it prepare you to have to surrender a vehicle because you simply don’t have the money to pay for it? Does the state disability workers care they haven’t processed your claim in over two weeks? Nope, they don’t; especially because you can’t reach a live person! Let’s add just a bit of icing to this pamphlet cake of missing information. Let’s have a clinic director call and “empathize” with you about how horrible cancer is. Let’s have her say how much she wants me to be able to deal with this, but she cannot produce ONE local support group. Then let’s have her reference how I work and since my schedule doesn’t accommodate the only group 30 miles away and starts before I could get there, I’m not being flexible. To add a cherry on this frosted bunch of glossed-over, “we’re here for you” information, that she will compare “if there’s a cure 50-miles away, would it be too far to reach”. Let’s put this in perspective. A cure is not a support group. A cure would negate the need for a support group. I bet she can’t tell the difference between apples and oranges, either. To say I’m angry is a true statement. These medical “professionals” have either been abusive, negligent or completely not interested in hearing me and/or acknowledging me and my need for LOCAL (as in within my own city – not clear across the county) support. I have found a group of ladies, online, who are fitting my support bill. They are or have been through the trials and tribulations of the Big C. I can vent and I’m not called, “inflexible”. I can ask questions without reaching a never-ending, button pushing, automated system before reaching a nurse with an attitude who simply relays messages to/from my doctor. Speaking to your doctor on the phone these days is a mortal sin. You can’t possibly express yourself without the aid of a nurse misinterpreting the reason for your call. The fundraiser is going ok, but it could be better. I am only $40 short of being able to afford two more rounds of chemo. I appreciate all who have, and continue to share my fundraising link. You really have no idea how much it means to me. These weekly cancer journey updates are to make those who watch cancer from the sidelines get a front row seat of the reality of what it’s like to deal with cancer. It’s not about ribbons, even though I use one for this series. Life isn’t a marketing campaign. It’s tough, emotional, draining and those who have cancer live with an uncertainty as to what their life will be like, become and how long it will last. I just got off a conference call with my daughter’s 4th grade teacher, the 3rd grade teacher and the principal. Her teacher spoke with me last week regarding catching her up to where they are in math. Now they want to include reading. I know switching schools can be challenging in regards to curriculum. We took our time, wasn’t heavy into testing, did some child-led learning, etc. However, we did follow each subject’s book and felt good about her progress. You always have to wonder what’s going on when the principal becomes involved. Basically, they want to put her back in 3rd grade. I vetoed that option immediately. My daughter can do the work; I just need to know where to catch her up. It’s challenging enough starting a new school. I don’t want her to feel punished because we worked at her pace vs a standards pace. We agreed she would do extra phonics work for reading and attend 3rd grade math. I’ve read about this happening to homeschoolers who return to school. It’s been one of my worst educational nightmares and it’s coming true. I plan to work with her on math and catch her up to 4th grade and her 3rd grade math can reinforce it. It will probably take the rest of the year, but we’ll get it done. Right now I feel like such a homeschool failure, even thought, rationally, I know that’s not true. My daughter’s never been a strong reader and she’s stubborn as the day is long when she’s corrected. Now I’m wondering if I made the right choice putting her back in school. I really hate having to work when I want to be home and this never would have been an issue. Just feeling judged, even though that’s not how they came across. 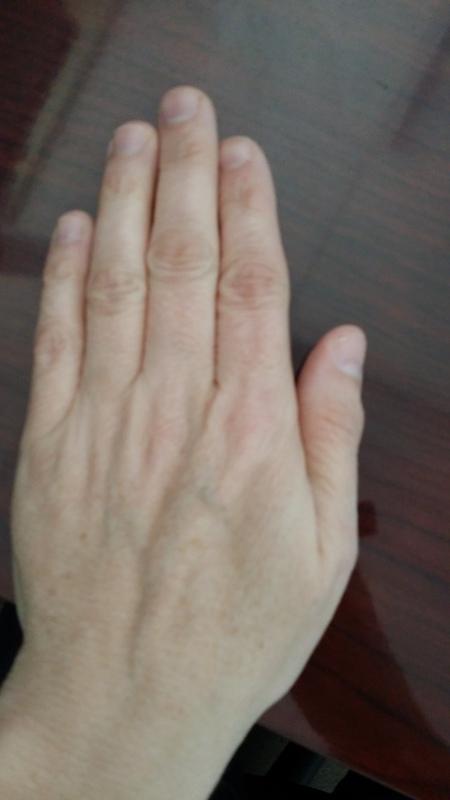 Yesterday in the car, my daughter looked at my hands and said, “you have hands like daddy”. I looked at her and asked what she meant. She took one of my hands and placed it next to her hand. Her hand is dainty, soft, long nails; picturesque of a woman’s hand, minus the nail polish. On the other hand, my nails were very short, full of wrinkles, a bit rough; but missing the the calluses that used to be present on my palms. I replied my hands aren’t as dainty as hers because I used to use my hands a lot. That seemed to quell her inquisitive mind. It got me thinking though. My hands show my life. They show that long nails, polish, being massaged with lotions weren’t the norm. My hands showed a worker’s life. I grew up very low, middle class. I know there were times that we probably qualified for some type of assistance. My dad only had an eighth grade education. My mother sometimes worked two jobs. We made due with what we had. I was responsible for watching my younger sisters. We grew some of our own food. We didn’t hire people to mow our lawn; we did it. Clothes were hung out on the line to save on the energy bill. It was just what we did. It’s how I grew up. I am not ashamed to say, I was a “chambermaid” back in the day. What’s that? Oh that’s right, they’ve changed the name these days. Most people are now called “housekeeping” when working in motels/hotels. I have waited tables, scrubbed toilets, tended bar, worked in gardens, help cut firewood. I grew up doing manual labor. My mother never stressed keeping our hands soft with lotion. Now, I have a working knowledge that I still use today, but it mostly pertains to my home. I work in an office, so I guess I’ve changed my collar from blue to white. I will remember when life was a lot harder for me, but taught me how to work through it. I am not ashamed of that now (as a kid I once was). I think some people today could benefit from working with their hands. Yet, I will always remember, with pride, why my hands aren’t pretty.